British rider James Toseland has said he is content to have claimed a place on the second row of the grid for tomorrow’s Estoril GP in Portugal. 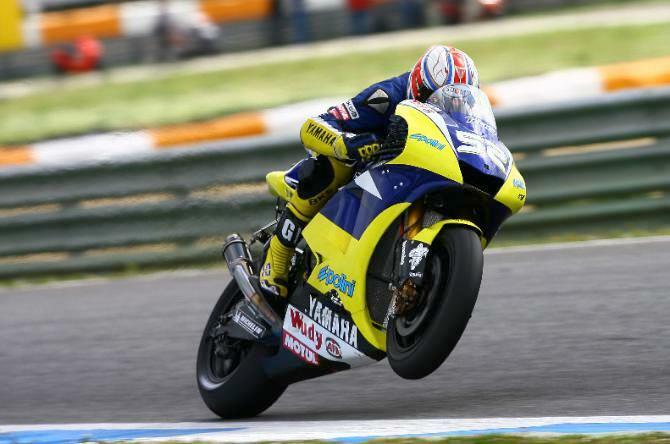 A best lap of 1.36.790 secured sixth place in qualifying for the 27-year-old, who earlier confirmed he would be staying with the Tech 3 Yamaha squad for the 2009 season. Toseland will start alongside Tech 3 team-mate Colin Edwards who finished fifth and the double World Superbike champion said: “I’m a second off pole and still sixth which just shows how fast the boys at the front are going because normally a second covers all of us. "I’m really pleased to get on the second row and it is a massive boost for me knowing I can come to a track I’ve never even seen before and be competitive near the front. "Considering the first session was damp, and I crashed at the start of the second session, with the track time I have had a second row start is a great effort from the team. "I had a small problem with my first qualifier on the left side but the other two worked really well and thanks to Michelin for that. I just made a few small mistakes because to go two seconds quicker on the qualifying tyres on a track I don’t know is a big ask. Everything happens so much faster and I was braking too late and approaching the entry too fast. "Against these guys you can’t afford to make a mistake. I’m looking forward to the race with the new engine. It is a big improvement and if I had the old engine here, coming off the last corner would have been difficult. It wouldn’t have mattered how hard I worked on the rest of the lap, I’d have been passed on the straight. But coming out now in third gear I can feel how much power the new engine has got.